This is the sole, extant example of Hugo’s writing as a son, rather than as a father. Though limited in writing space, this postcard still shows a son’s challenging his father’s judgement as well as seeming to desire his father’s approbation. 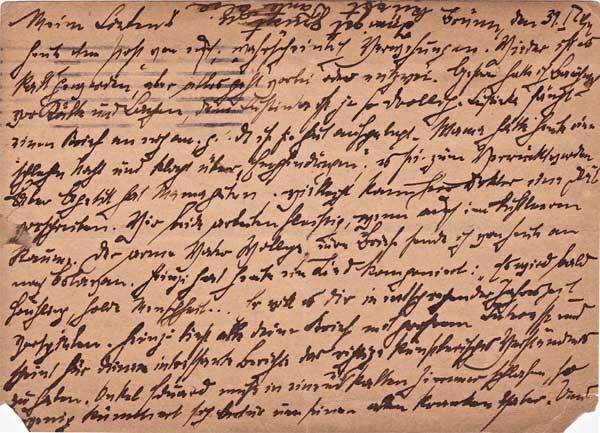 Hugo reports on family problems, as well as praiseworthy characteristics of his youngest daughter, Anna/Lussinka and of Heinz, his new nephew by his marriage to Fritizi. All of the above, combined with Hugo’s coded, cryptic and metaphoric references, e.g., “Bolavan,” “appropriate season,” also reveal Hugo’s current bitter political understanding, as well as his strained and constrained life as a Jewish refugee under Nazi rule. Today mail from you arrived, probably with some delay. It has grown cold once more, but everything will pass, either that or fall apart.1 Yesterday I had a stomach ache from cold and laughter, because Lussinka2 is so very funny. Lussinka begins a letter to you; g. He is in such a good mood.3 Today Mama had a dreadful night and complains of “sensations;” it could be enough to drive her mad. But Mama has a hearty appetite. Perhaps the doctor can prescribe a diet. We both are working away very diligently, despite being in an airless room. Wolly’s poor father.4 I will send your letters from today on to Bolavan.5 Today Heinzi composed a song: “It will soon be spring, lovely mankind.” He wants to play it for you in the appropriate season.6 Heinzi reads all of your letters with great interest and appears to have the right artistic understanding for your interesting reports. Uncle Eduard has to sleep in an ice-cold room; Arthur shows so little concern for his old ill father. And then you want him to take care of Aunt Jetti – [the] idea that only you have of this brute. I got his old father a magnificent Termo heater, nowadays quite a tricky accomplishment, but even after two weeks, he still hasn’t paid me the one Mark he owes me. My dear ones, I am filling this small space with countless kisses for all of you. 1. It iseems very likely that Hugo was (presciently) alluding here to the passing of the Nazi occupation and terror — or its falling apart. 2. Lussinka was one of the Russified nicknames that Hugo gave his youngerst daughter, Anna. 3. It is likely that it is the droll sarcasm in this statement by Anna that amuses Hugo. Re: the “g.” that precedes this example of Anna’s humor: although “g.” is not a standard German abbreviation for “genau” (Engl. - exactly), it is possible that Hugo abbreviated “genau” here to indicate to his family that the words that followed were the exact words that Anna had written. 4. Wolly and his father are unfortunately, unknown to us now. 5. I believe that “Bolavan” was a code word between Hugo and his family back in Vienna, because the only “Bolaven” in the world is a plateau in Laos, and it seems extremely unlikely that Hugo and Siegmund had contacts in Laos. There is a very small chance, however, that Bolavan referred secretly to Max Jellinek, who was in Asia, as a refugee in Shanghai. 6. Hugo could have safely counted on a German censor interpreting “appropriate season” literally, as meaning the forthcoming spring season. But it is very likely that Heinz and Hugo meant “appropriate season” figuratively and metaphorically, to mean the time in the future when the Nazis will be defeated, people will experience new hope and healthy new growth and mankind’s loveliness will prevail again. 7. Putzi = another diminutive nickname for Hugo’s youngest daughter Anna. 8. Unfortunately, we do not know “Aunt Else’s” identity. 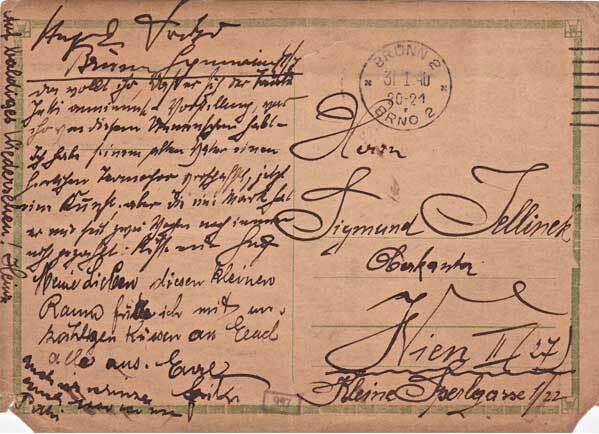 But there is a slight possibility that the sender of these warm greetings was one of two women in the extended Jellinek family named “Else” or “Elsa,” both of whom were likely in Brünn at the time: The first “Else” could have been the wife of Ignatz Jellinek. Ignatz was the son of Jetti Jellinek, who was Siegmund Jellinek’s sister. However, this Else Jellinek was not an aunt to either Siegmund or Hugo. This Else was Siegmund’s niece by her marriage to Ignatz, and thus Hugo’s first cousin. There was also Elsa Schafer Skoutajan who was one of the four daughters of Max and Paulina Schafer. Max was Berta Schafer Jellinek’s brother, and thus, this Elsa was also not an aunt to Siegmund, Berta, Gisela or Poldi, but rather, Siegmund and Berta’s niece, and Hugo, Gisela and Poldii’s first cousin. Perhaps one of these women was accustomed to calling herself “Aunt” (“Tante”) .